Not much done on the ol’ studio the last few days. We went to see Justin get an MBA honor and win a 25 km trail race last weekend, which is why this post is late. Just when we get to see him run for the first time in a while, the weather at 6:30 am is back down in the twenties. Still, a good time was had by all. He lent me some running clothes so I had on running tights, jeans, four tops and my coat, hat, and gloves and managed to stay warm. I went ahead and ordered the ACEO sleeves, so they should be coming any day now. When they get here I can make the determination of how to use them. I may go to the local craft store and get a fancy scrapbooking hole punch and some nice ribbon. I am thinking of marketing them in groups of one or three, just like the book marks, as frameable keepsakes. We’ll see. I’ve asked friends and family but there doesn’t seem to any consensus so I may just have to try them both ways and see what happens. I am rather anxious for the sleeves to arrive, so that I can move to the next phase. I have started lining out my next drawing. I decided to work on an interesting entryway of a house. It has good lines, unique sidelight windows and pretty landscaping. I was in the mood for something a little different from what I have done recently on the architectural front. It is almost drawn out and I may start inking the landscaping today. 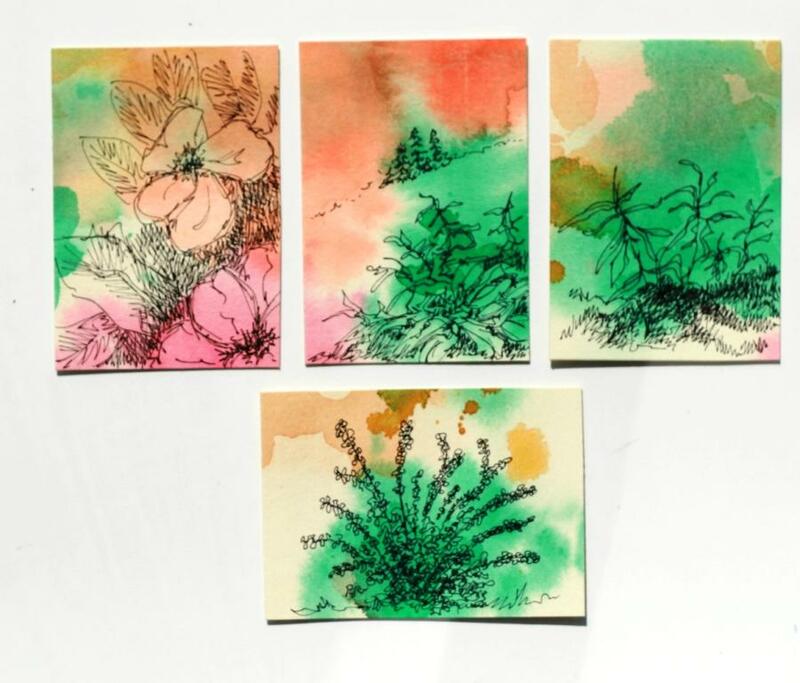 Because I’m behind in the studio, here are a few watercolors which I painted a while ago and quite liked. Spring has sprung here, at least for a little while. My daffodils had a few buds last Thursday and yesterday I picked some blooms. I’ve never seen them develop that fast. Not complaining, mind you, because I wait all year for this. I love my daffodils. Yesterday I planted 4 grape vines that I bought at Sams Club. Two whites and two reds. I hope they make it but of course I won’t know for a while. The red and gold raspberries and the blueberry bushes we planted last fall in the midst of the drought have started to bud out also. I have been trying to grow the red raspberries for many years after my first sets finally died out without much luck . This year I am going with some mir-acid in hopes they all make it. At least the winter didn’t kill them. I did make it back into the studio to work again on the tags the last few days for a little while. It is funny how, sometimes, it is hard to get going on a project again. I stared at the blanks for a while before I could start to draw on them. I felt a little intimidated at drawing over the colored background in fear that I might ruin them. I finally started on the ones that appealed less to me (although I really liked them all) and by the time I had done a couple, I got into the creative flow. I ended up using up all but three. I really like the blend of colors on those and am not sure that inking over would improve them. Perhaps I’ll just sell them as they are. I investigated the aceo sleeves and they appear to have 1/2″ extra in both dimensions. If that is true I will be able to punch a hole in the holder, keeping the tag intact and useable as an aceo. I may decide to put in a white backing sheet (unattached) where someone could write a short note to be saved or discarded at a later time. I ordered the sleeves yesterday and will have to wait until they arrive to make a final decision. In any case I have decided not to punch a hole. This has been a lot of fun and I have the next sheet ready for cutting. I will probably cut it today and then start lay out for my next drawing. These smaller projects are good for the down time when I am letting a picture rest so I can look at it with new eyes. And because I said I would show it, here is the last drawing. It’s up in my etsy shop already. 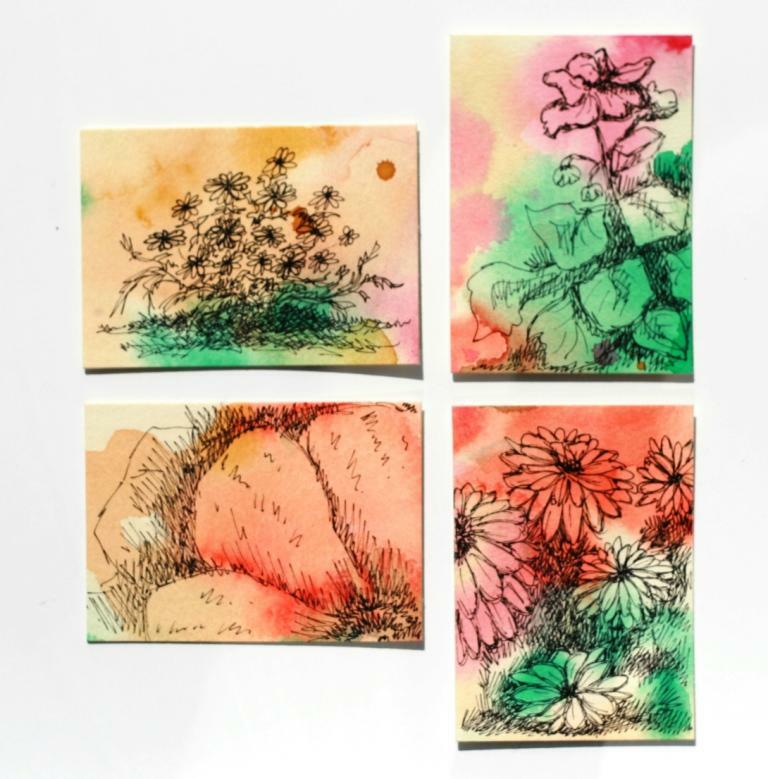 Tags or ACEO – What should I do? First of all, let me wish everyone a happy first day of spring. I can’t think back to when I have been so glad to see the back end of winter arrive. Whew, but I can’t wait for my daffodils to flower. And I already have buds on a few. 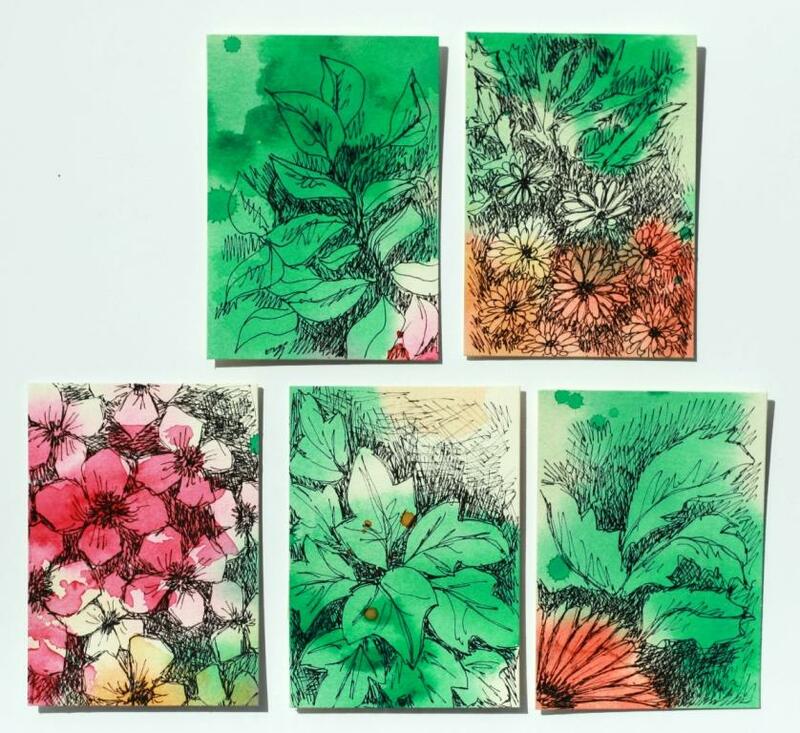 Now onto the tag project – or is it ACEO? I can’t decide. I went back after the big sheet of watercolor paper had dried and fortunately it was flat again. I stared at it a long time trying to decide what to do. I decided to be bold for a change. 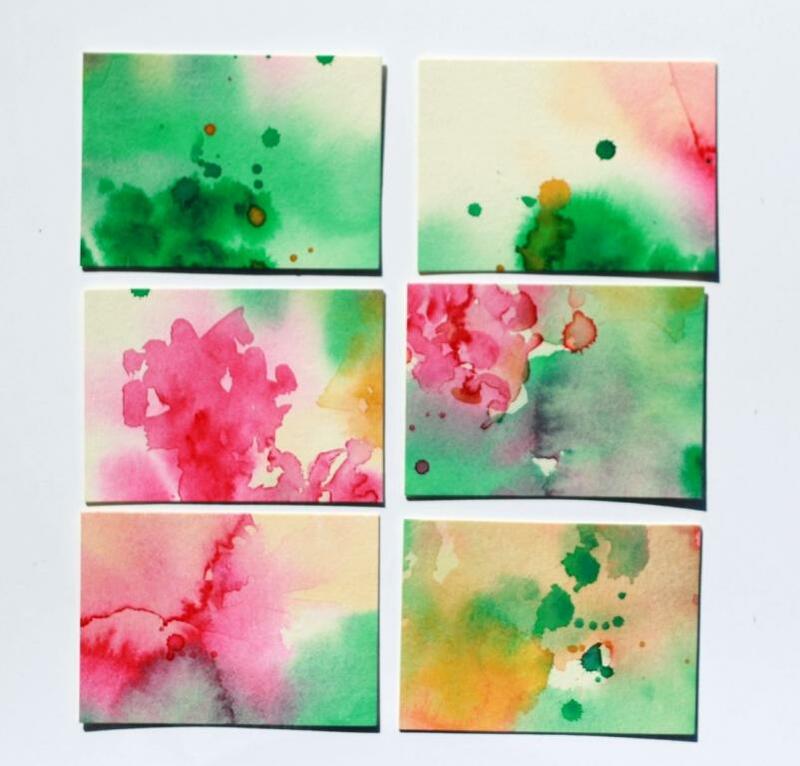 What the heck – it was only a sheet of watercolor paper and I had plenty. I would try to add some more washes and some heavier color. I lightly put on a clean water wash over the previous day’s work, being careful not to brush down hard where I had color layed. I saw a very little bit of movement from the older wash but not enough to be concerned about. Then I layed in some more washes and drops of color. When I felt that I had covered with enough colors, I let it alone to dry. I came back the next day and stared at it again for a while. Should I add more or start to cut it up? I opted not overdo it – always a hard decision on where to stop. 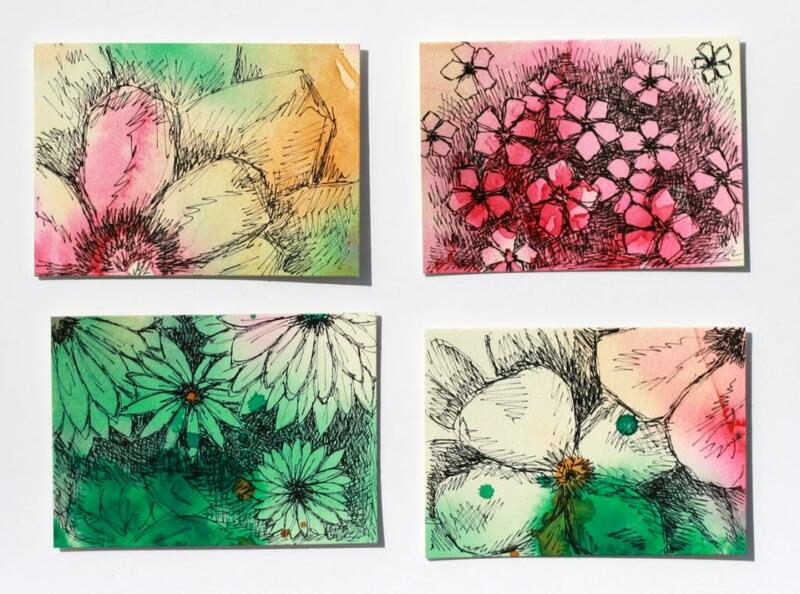 Overnight, laying in bed, I had the thought that rather than cutting up the paper in business card size for gift tags, perhaps I should make them the little bit larger ACEO size and expand my options. So I plotted out a few areas that I thought would make a pretty background and then started cutting. This was actually easier to do mentally and emotionally than the last time I cut up what I had done. I was glad, as it turned out, that I decided to make them bigger. I think that it took better advantage of the colors. Odd how just a half-inch size change could make such a difference but I think it did. Here above are some of the pieces. I think they are pretty nice on their own and haven’t decided what to do with them. I like them all well enough that I don’t know whether or not I want to punch a hole in them for use as gift tags. Perhaps I could get some ACEO card holders and punch the hole in them instead. That way they could be used as a gift tag with a little bit of writing on the back and kept as a keepsake. I’ve not bought any holders yet so I don’t know what is possible. I guess that I will be working that out over the next few days. It’s nice to feel satisfied with something I have done for a change and to be looking at options instead of the circular file. Since I’ve finished the latest stone barn picture, I decided to try out the gift tags project. 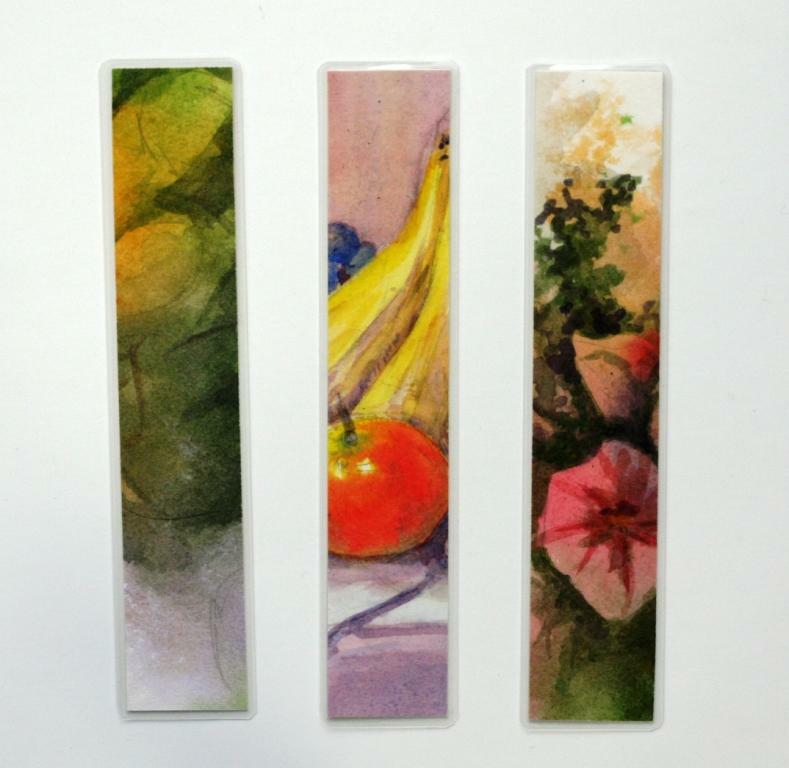 I thought that it would make a nice accompaniment to the bookmarks – just not laminated. I decided to try to run the watercolor base on a whole sheet of paper instead of each individual piece and then cut it up and decorate it. Easy, right? Guess again. I have this nice little watercolor paper stretcher thingy and tried to use it. It holds a sheet of watercolor paper about 14″x21″ and I thought that if I ran some mixed color washes over it, it would make some interesting backgrounds for sketches on the tags after I cut it up. I followed the directions for stretching the paper and locking it into the frame, but I must not have soaked it thoroughly enough. When I tried the washes, major buckles occured. The colors ran in not so interesting fashion and I spent my time trying to “artistically” mop up the pools of color. Not good. I had to stop and let it dry, hoping that it would at least flatten out again and maybe parts would be salvagable. the good news is that it did dry flat enough to use. I am going to try to cut up the paper into useable pieces. I am afraid if I rewet it and add more paint, the colors will run into a more muddy mess. I hope that at least a number of pieces will be usable when I cut it up – otherwise most of it will end up in the circular file. I will have to be better at stretching the next piece today. I am encouraged enough after the bookmark experience to try again. 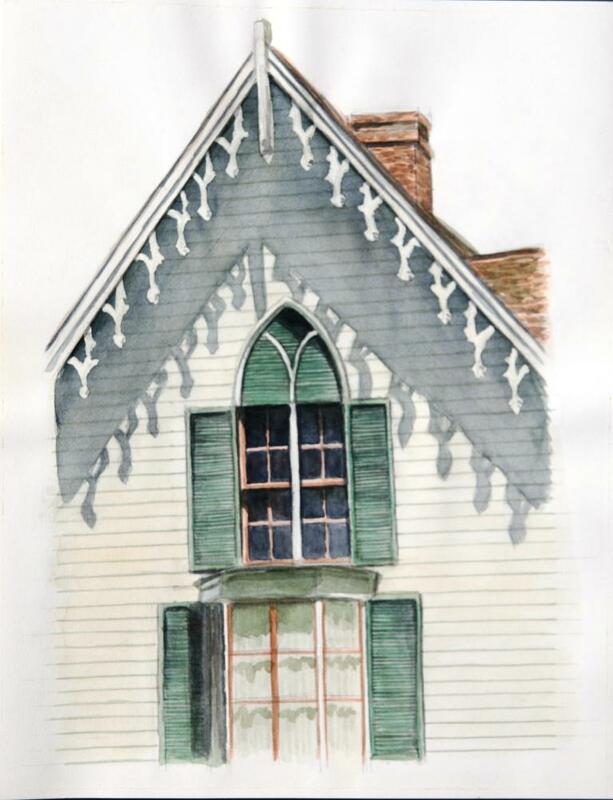 I think most of the difficulty arises from my inexperience with the heavy watercolor paper. I need to keep experimenting with it and maybe use a lighter weight. I just have a large stock on hand of the heavy. I’ll post a picture of the barn next time. Next on the list of to-dos is to put it up on etsy. Time change, schmime change. Let’s just leave the sun alone. I live in a state where the time change that the rest of the country dealt with was not adopted until a few years ago. I had grown up with it so originally it wasn’t a big deal when I moved here, but I tell you, after almost 30 years without, I unknowingly got very used to it. It wasn’t ever a common thing to think about, of course, but it was a comfortable thing to live with. The only hassles were trying to explain to people in other states that our time relative to them varied over the course of the year. Well, a couple of years ago, someone in the governor’s office got too smart for his pants and somehow managed to push through a law to get us onto daylight savings time. And I think much of the state, for the most part, was happy with the way things were before. It was a little bit of distinction out here in the Heartland. We weren’t so ruled by our clocks as others. I could even tell you the approximate time of day depending on where the sun was. For years this was screwed up for me, and it is only lately that I can do it reliably, minus a few weeks around the change. And I think that the rationale for it has certainly changed. The farm population has dropped dramatically and many work at outside jobs, so the farm work has pushed on into the night, as has the use of lights on the farm equipment. Do we really need to have kids up until 10 or 11 playing outdoor games and small children put to bed in almost full daylight? Now, we have light in the summer until 10 pm and the “noon” sun comes about 2:00. Do they have DST in Europe or Asia? Does it really improve productivity anymore when we are now on a world wide 24 hour a day schedule? I have my doubts. With all of the studies on the sleep deprived population in the US, why add onto all of the stress that we have in our lives already. AND, if anything, we should have been put onto Central time. Enough about that, I guess. It just irks me twice a year to have to do this for what I believe is no real reason. I’ve started coloring my barn this week, but it’s not done yet. I’m going to use the watercolors mostly, I think, and add in a little colored pencil. I took advantage of the nicer weather we have been having and spent a little time outside , pulling up some of the dead plants in the bed. I know, I should have done most of it last fall, but oh well. My daffodils have finally started to come up about 3″ now. It’s a little late but after the cold of the winter I am glad to see that most of the shrubs and flowers have survived. My cold tolerant herbs seem to have made it through and the lilacs and newer forsythia plants are starting to show buds. It’s a relief because it was such a bad winter. I heard the birds start to sing ouside at the barn where I keep my aging quarter horse mare. I was worried all winter that she would fall in the ice and snow and since she can’t get herself up anymore that she wouln’t make it through. But she did and is now shedding out small dogs in anticipation of warmer weather. 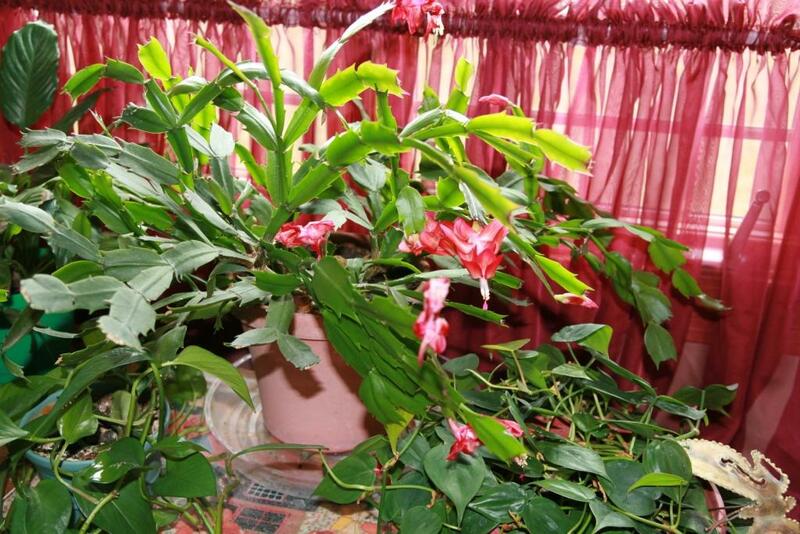 In honor of the long winter that started early and stayed late, here is a photo of my confused Christmas cactus. It is reblooming for the third time in the last six months. I prefer to think that it is merely giving me a little bridge to the spring and summer flowers that I love so much. Early last year, after we finished most of the work on the new house, I tried to become more diligent about my artwork. I finally had a dedicated studio space and it was time to put it to use. I wanted to start to publisize about my art and enter the new world of social media to promote it. But how to start. It is so easy to fritter the day away on the computer and not get any real work done – either on the computer or in the studio. I put one of the many “gift” calendars I had gotten down in the studio to help me keep track of my time there. And you know what? It was discouraging. Sometimes a week or two would go by with only an hour or two spent there. Often I couldn’t even pinpoint what I had been doing, only that something else was going on. There was usually a fairly good reason for how I spent my time, but it all still seemed to just be flowing away, out of control. I came to the conclusion that I needed to have at least some semblence of a schedule. Not too strict because life happens, but it was apparent that I needed a plan of action. Even though we have had a home office for decades , we have cut way back and I needed a way to get myself more organized. I decided to divide the day up into mornings on the computer and afternoons in the studio. I tried to accomplish only one new computer thing at a time instead of spending hours at several. I could stop at an accomplishment instead of in Luddite frustration. One thing that I noticed as I was spending more and more time at the computer was that there seemed to be this ever increasing pile of post-its scattered all around the computer desk. They were all filled, sometimes front and back, with miscellaneous information that was important at the time, but then was unneeded. Unfortunately, there was usually long term info on most of the papers too. It seemed like I had a whole pad’s worth of papers scattered or in piles with the pens and pencils hidden somewhere within. I swear they were breeding overnight, crossing good info with bad and creating a yellow disaster. What to do? Copy the good info on another few post-its and toss out the old? There seemed a perpetual paper trail of those unruly notes. The answer turned out to be easier than I thought. I relegated the truly ephemeral, short lived to a hopefully smaller post-it note pile and got a spiral bound notebook to write the more permanent and important stuff in. I started by copying the good stuff into the notebook and then discarded all of the paper. Suddenly, I could see the desk. Over the last few months, I have filled up a half a dozen pages in the notebook and managed to keep the post-its to a minimum although I admit lately they have tried a sneak attack to get back in. I (sometimes) date the notebook and star or underline really important info, but it is pretty laid back. It is reassuring that even if it takes a while, I will be able to find something that I want and not be afraid it was lost on a discarded note. And let me tell you it takes no more time to look through the book than it would have to try and sort out those pesky notes. I got a project notebook from a big box store and started keeping all of the data for my online sale listings in it. I now know when and where I listed something, if it was featured, and how often it is looked at. All good data that I had wanted but never gotten around to keeping. With these two innovations on my part, I can now have a better business plan. I got a small pocket calendar for the office too. I keep hours for the drafting business and also what I do on the computer related to my art business in it. It helps me to keep more focused and I can actually feel accomplished when I see what I have done over time instead of frustrated. The hours in the studio have gone up dramatically too. Now I keep a record of how long I have worked on a drawing and how much time I spend there on other tasks like the bookmark project which had about as much layout time as painting. Anyway, I feel now the office clutter is more managable. Even after working in a home office after all these years, it is still easy to get behind. There is no “boss ” to keep me on track and these simple devices have helped me a lot. I’ve been so busy lately since I got over my illness. I made a lot of the bookmarks and have gotten everything laminated at the big box store. If things go well, I will consider purchasing my own office size laminator. I can’t justify it yet, but I would like to have more control over the process and lamination thickness and not depend on what I can buy and the skill of the laminating clerk. If somethings gets ruined, I want to be able to blame myself. And here is the new table. I had been using our old kitchen table with a leaf insert that my parents bought at an auction and refinished for me 30 years ago. It was relegated to storage for a number of years and then used as my studio table in the new house. It has served quite well for the last couple of years while I was getting up to speed in my first dedicated studio space. Unfortunately when the kids used it in the stained glass project and I started making the bookmarks, its flaws became more obvious. 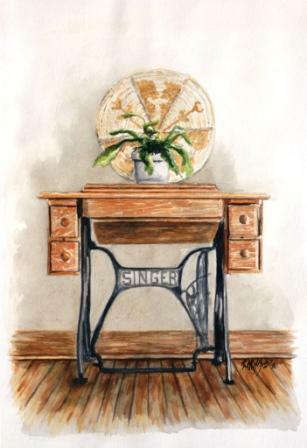 When I was just sitting at it, putting projects or mail together or painting small watercolors on my plexiglass sheet, its center bow didn’t really matter. However, when the kids were cutting and snapping the glass pieces or I was trying to use the mat cutter for the bookmarks, it challenging at best. I had only a specific place on the end where the cutter could lay flat for me and the kids had a lot of trouble snapping the larger glass pieces apart against an edge without them shattering. Fortunately, we live in the vicinity of a large state university and you wouldn’t believe some of the stuff that they get rid of. The university operates a surplus store that sells outdated computers, older but serviceable chairs and tables, and office furniture. I take a peek in there once in a while and in fact that is where I was able to buy my map size flat files at a great price which I snapped up without hesitation. (They were a little dinged up, but at 10% of new ones, I wasn’t about to complain.) My sister had just gotten a great work table there so I decided to stop by and see what was left. There were, in fact, two tables to choose from and this is the one that I got for only $50.00. 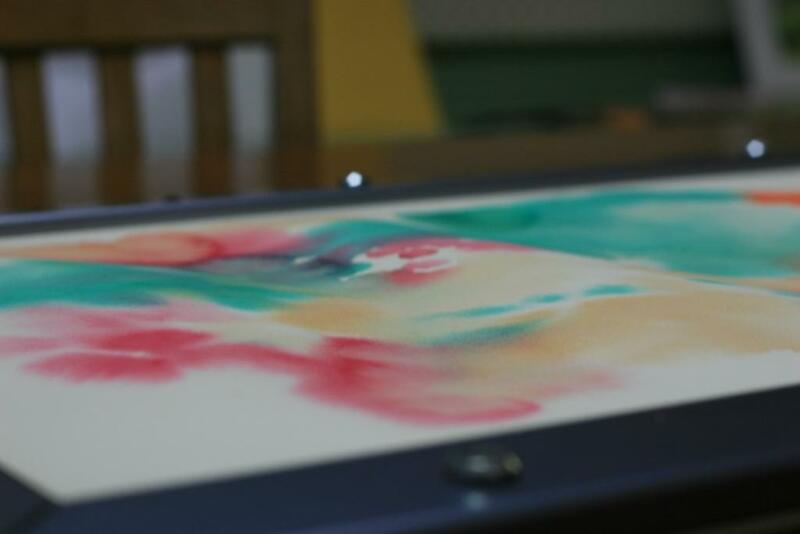 It has a metal frame and laminated top, but is the whole surface is flat and I can work anywhere on it that I want. 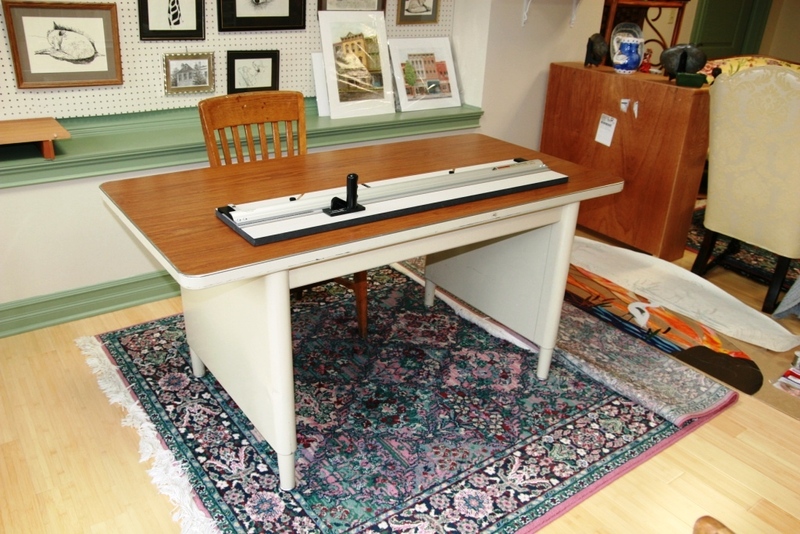 It has a drawer on the other side and measures 30″ x 60″ – big enough for just about any project I might have. I got it home, washed it off with a bucket of lysol, and it looked even better. I hate to think what I washed off but it is about as clean as I can make it now. If the scratches bother me after a few weeks , I’ll get some metal paint for it. Right now it is great to have a really flat surface to work on. I’ve broken down the old table and will keep it for a while to see if the kids or nieces may want to use it for a work table in the future. It’s always good to have an old table around. 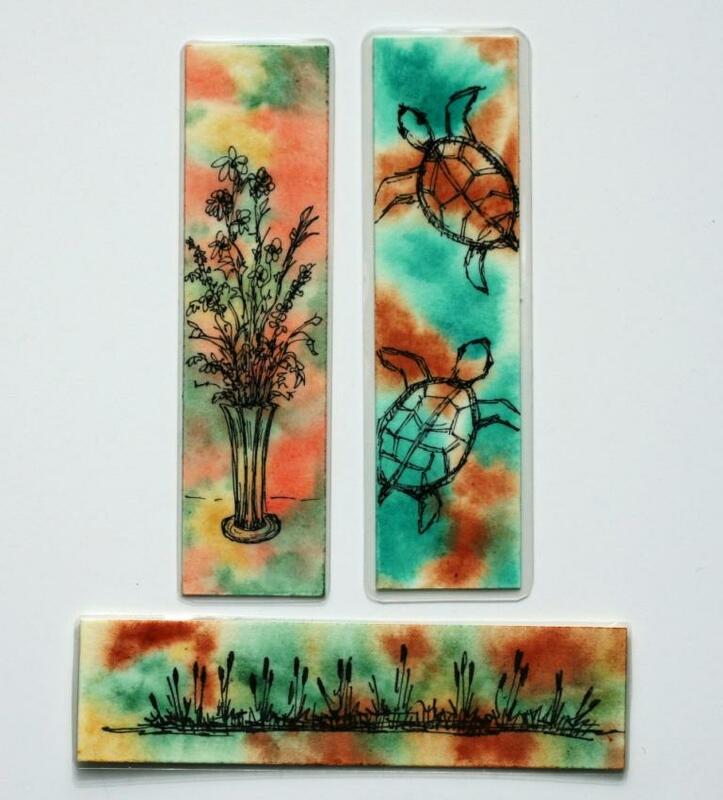 Here’s my latest etsy bookmark listing. 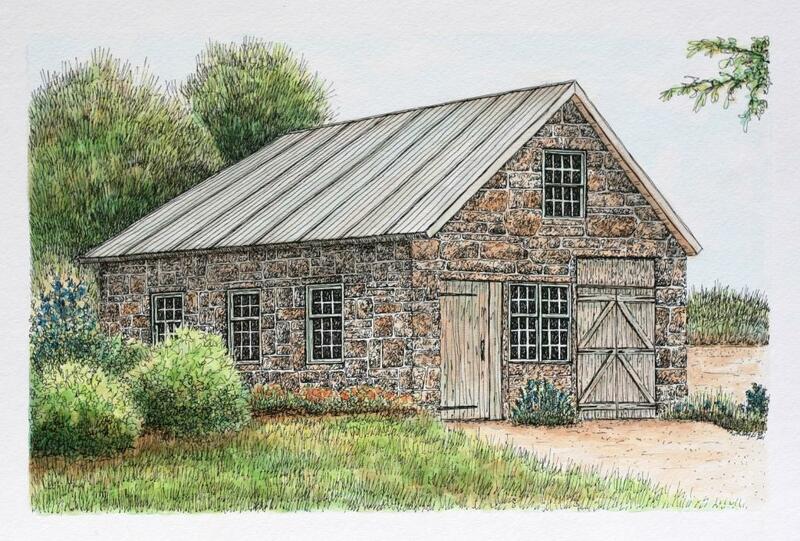 I’ve started work on a new stone barn and hope to have it finished this week. It’s a little different in that it is of a whole barn and not just a smaller view.